BetOnline.ag has proven to be a master of its craft by delivering a one-stop shop for online gambling optimized for both fiat and Bitcoin players. Offering the combined betting platforms for casino, sports, and poker magnifies the entertainment, excitement, and rewards in store for the online gambling community. Thus, having all these three on one website is highly appreciated by the avid bettors. BetOnline.ag is an online sportsbook, casino, and poker room rolled into one, and it has been in the iGaming industry since 1991. 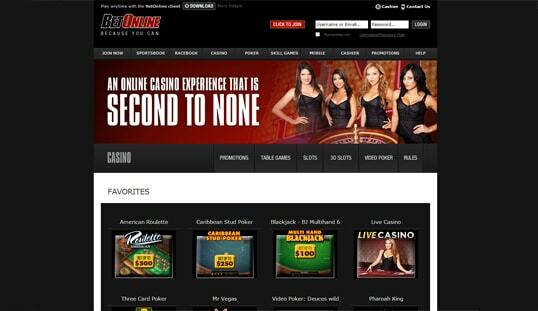 Throughout these years, it has been adhering to its primary goal of providing patrons with the most groundbreaking and vibrant online gambling experience. As a sportsbook, BetOnline.ag features a wide variety of sports like basketball, golf, football, boxing, and many more while also covering local and international matches like the NBA, NHL MLB, and NCAA. Casino enthusiasts, on the other hand, can expect the popular classic table and card games next to the high-definition 3D slots. A live casino is also available here. Meanwhile, its poker room is filled with multi-table and single-table tournaments made even more lucrative by the host of poker promotions and bonuses. If these are not enough, this gambling site also provides racebook betting services. 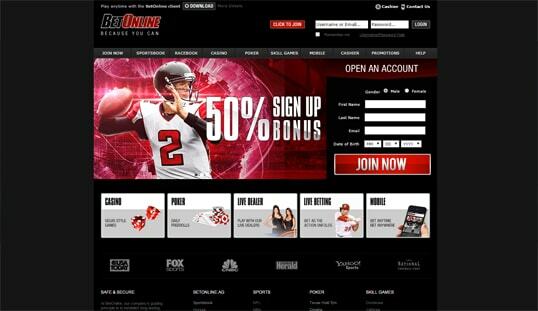 The sports betting platform offers the typical roster of sports and betting features, but players are guaranteed to appreciate its user-friendliness. The casino games, on another hand, load in any web browser, especially the games developed by leading names in the industry like that of BetSoft. When it comes to poker, however, the software must be downloaded in order to play the card game. While not all games promise cutting-edge graphics, the majority of the games bear high-quality designs that are reasons enough for players to enjoy betting. BetOnline.ag is not exclusive to Bitcoin. In fact, it primarily caters to fiat bettors, and this reflects in the account registration steps that require players to provide personal information. If this is not a cause of concern, signing up should be a breeze, even for players who prefer to use Bitcoin. Fluid and instant Bitcoin transactions on this website are never hindered despite catering to a number of currencies. BTC deposits only take 24 hours to complete while BTC fund withdrawals are processed within 48 hours only. Thus, players are certain to enjoy fast and hassle-free Bitcoin transfers uncommon in most real-money gambling sites today. BetOnline.ag is packed with more than a dozen of bonuses and promotions that cover the casino, sportsbook, and poker room. New players can get the 50% Welcome Bonus while casino players should watch out for the High Roller Rewards, Reload Bonus, Slots Bonus, and Cash back among others. Sports betting fans, on another note, can get more freebies through the attractive rewards for live betting, mobile betting, and others. Moreover, the poker promotions feature high-paying tournaments and signup bonus deals. Other than the platform-specific bonuses, this gambling site also rewards players who refer others with a $50 bonus. BetOnline.ag is proud of its effective customer support department that is open 24/7. Bettors that have concerns or queries regarding the site can get through this department via a phone call or email. More importantly, there are various email addresses for the specific betting platforms for a more convenient and quick support system.